Our Keto Cheese & Zucchini Muffins are tasty, moist and very easy cheesy. These savory keto muffins are great for breakfast that can be made ahead and reheated as a keto snack. Even before embarking on the Keto Diet I loved to eat all kinds of cheese. I cooked a lot with cheese, and generally made a mess in the kitchen with cheese. Hence why there are many cheesy recipes on our blog – try our Bacon & Sour Cream Muffins, Cheese Chips, Broccoli Cheese Bites, and our Cheese & Bacon Rolls. These Cheese & Zucchini Keto Muffins are best served warm, with the melted cheese oozing as they’re torn apart. This recipe makes 12 serves, one keto muffin is one serve. In a mixing bowl, add the zucchini, butter, salt and pepper and mix well. Add the eggs, oregano and baking powder and mix well. Add the coconut flour and mix until the batter becomes thick. Fold through the cheddar cheese. Line the holes of a standard muffin tin with silicon cupcake molds and evenly divide the mixture between the holes. Overfill each hole creating little piles of soon to be muffins, the muffins don’t rise very much. Bake for 25 minutes, until the muffins are golden. Allow to cool for 5 minutes before enjoying. 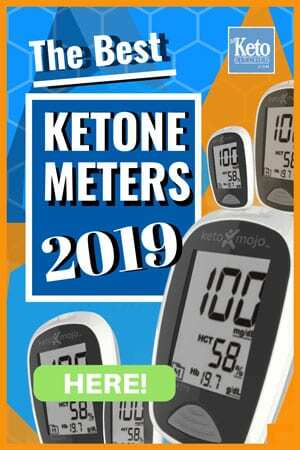 Check out and make our other low carb baking recipes and our new and improved keto bread recipe. 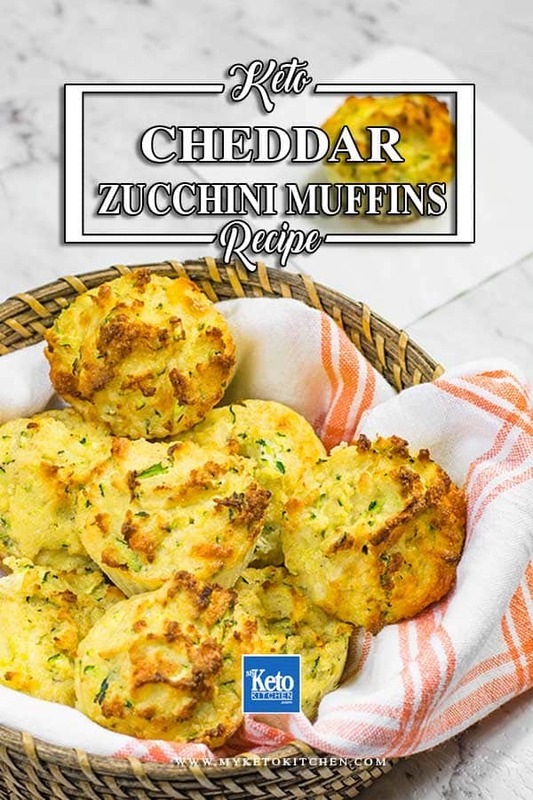 To make a larger batch of Cheese & Zucchini Keto Muffins adjust the serving amounts in the recipe card above. Just made these… do you think they would freeze well? I haven’t frozen them, but I think they will be fine. Any excess liquid from freezing will be soaked up by the coconut flour. Do you need to squeeze out liquid from the zucchini at the beginning or does all the juice help keep these moist? 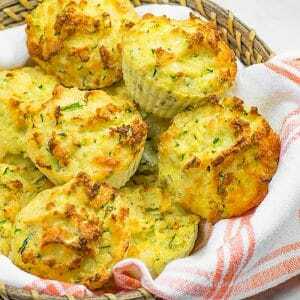 No need to squeeze out the liquid from the zucchini, it keeps the muffins lovely and moist. How many muffins is one serving? The recipe makes 12 serves, one serve is one muffin. Great recipe, thanks. I did not find them to be overly eggy, and found the coconutty taste is a bit less when they are cooled. Loved them cold with a bit of butter. I added bacon and cayenne pepper and saved some of the cheese for the top. The whole batch was demolished by my family and I in 2 days! Absolutely loved these, and so easy to make – Thanks for the delicious recipe! Glad you enjoyed them, I’ll pass the message on to Gerri (she’s away at the moment).. I like them too! Thank you for your kind words Sherelli! Ah-mazing! This will now be my go to muffin. Will be adding bacon, ham, and other goodies for my husband the carnivore! Thank you!!! Thank you for your kind words, Susan!! This was my first attempt at at Keto baking and these were great. I did add bacon after reading one of the comments, every thing is better with bacon. Thank you for the recipe, keep sharing please. You are right Sunsh, everything is better with bacon!